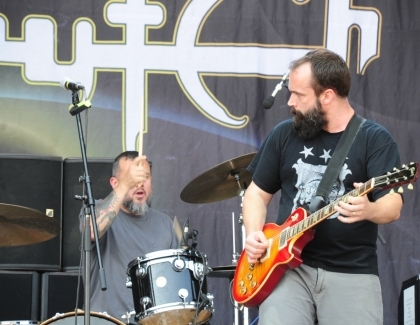 Leaving behind a windy and cloudy Vienna, I arrive to a sunny, warm and even more dusty festival area just in time to see Clutch on the Blue stage. I was so looking forward to see them again and it was delightful. Neil Fallon's deep voice is just beautiful and a treat for the ear. Show wise it's not much to see, but they compensate with the quality of their groovy blend of rock, punk and blues rhythms and insane pedal effects for their solos. This counted for a perfect start of yet another hot day at Nickelsdorf. Off to the Red stage to catch the Norwegian quartet, Katzenjammer. I heard a decent part of the soundcheck, as every tiny bell, banjo, harmonica and sound making stick or chord on stage had to sound accurate. The four girls, who constantly change instruments after each song, came on stage in cute girly outfits to the excitement of some of the members in the audience. They played banjo, piano, harmonica, accordion, drums, trumpet, guitar, a huge bass with a cat face painted on it, all these combined to offer us everything from folk, country, Balkan, rock, pop, waltz. One of the girls had a song during which she played 3 instruments at once. Another thing worth mentioning about them is the power of their voices, but I highly recommend you see them live as they have a fantastic and uplifting show. I skipped Times of Grace on the main stage and listened to their metalcore songs from the backstage. I came back in front to watch Cavalera Conspiracy - which turned out into a big family show more or less. No matter how often I see him live with various projects, it hardly gets boring to see the moshpits that Max Cavalera manages to start among the crowd. The surface in front of the stage has 2 rows of fences called wave breaker so that these phenomenons don't get too out of hand. Yet, the madness is enough to keep the ambulance people busy. On a side note, I went by to ask for a pain killer due a headache and I got countless surprised looks, considering the real problems that were occupying their beds. Back to Cavalera, his voice is still strong, the band performed both Sepultura and Soulfly classics but also promoted the new album, Inflikted. Cavalera asked the crowd to lift the horns in the sky, got Max' stepson, Richie, as a guest for a song called Black Ark, and Max's nephew (Igor's son or nephew, not sure) to play drums for a song from Roots album. I don't know how often the kid played in front of so many people. He did it with so much intensity that it seemed like he would make holes in the skin of the toms. This was prevented though by the fact that he kept missing his drum sticks. The last guest of the band was probably the drummer's little kid who was hanging on to his dad's leg after the show, and who got to throw papa's sticks to the audience. Ex Misfits' vocalist, Danzig, was another show without photo access so I went further back with my friends and watched it comfortably from some chaise-longs, with the exception of the last 2-3 songs when we moved forward. These were the main hits (Mother and Am I demon) and Thirteen, the song he wrote for Johnny Cash. Am I devil was a comeback done because no one knows when they'd return to Austria, and such a comment was pleasing to the crowd. Everyone on stage was dressed in black, the music continuously reminded of Black Sabbath, the deep voice sounded very pleasant and despite the good old fashioned guitar solos and the continuous move on the stage, I can't say I was too sad when the concert ended. The evening went on with Korn's show on the Blue stage. A guitarist with a white cross painted on his face, the vocalist wearing a kilt and holding on to the fancy alien like mic stand, a drum kit the size of China and a lot of dreads spinning wildly were the main ingredients of their show. As usual the band performed a mix of own stuff with cover of famous songs and they did it with a lot of skills and energy, creating a very compact crowd from the front of the stage until far in the party area. I left before the end though to catch the Irish folk/punk tunes of Flogging Molly who had probably the most entertaining show so far. Not necessarily due the action on stage (although the guys in the band are rather talented at jumping and spinning around with their guitars and banjos), but due the mood in the crowd who started yelling 'One more check' before the show begun and didn't stop dancing, clapping nor jumping until the end, making the dust rise high up into the air and almost impossible to breathe. The main man in the band is a good entertainer as he continuously talks to the audience in between songs, offering them a Guiness, telling stories from the Irish history and how they connect to the next song and introducing each band member, including his wife who beautifully plays the fiddle and violin. What I recall is that Drunken Lullabies was sung to celebrate that there's finally peace in Ireland and people should sing and dance for that, while for Float we were asked to raise our middle fingers for governments and politicians. Many songs from the latest release were played, but the ovations heard when a familiar tune would start and the applauses following the drum beats gave me goose bumps most of the time. On my way out I caught about 3-4 Volbeat songs, most of them heard while walking. As they had the main stage for their performance, the light show looked impressive and I noticed some slides on both sides of the stage allowing the guitarists to go closer to the crowd. As each time I saw the Danes live, they looked like their batteries are fully charged at any second, as at least one of them is always a bit forward doing a solo and getting the crowd to cheer for the 'Elvis metal' that they became famous for. I was very satisfied to have heard The garden's tale fully and witness it in front of the stage and after that I went to catch a bus and avoid the flow of people at the end of the shows.